Thermowells provide maximum protection for thermal sensors from corrosion, pressure and flow induced stresses. When selecting thermowells these parameters determine the type and material that should be used. In general, thermowells are machined from solid bar stock for “A” dimensions to 24″ but for londer lengths a built-up design is used. Select sensor location for representative temperature measurement. Provide sufficient depth of immersion so that heat transfer along the instrument does not influence temperature measurement. Select materials that are compatible with corrosive media elements. 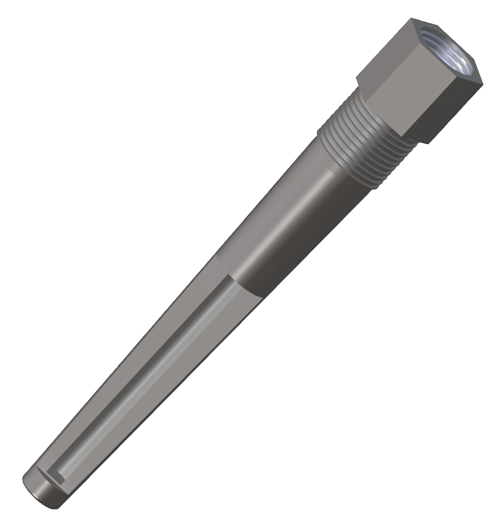 Select thermowell with sufficient stiffness to resist destruction from flow induced stresses. For Mechanical Application Considerations –Click Here! Strength at operating temperature and resistance to corrosion are the primary considerations in material selection. Carbon Steels – Can be used to 1300°F (700°C) usually in oxidizing atmospheres. Austenitic Stainless Steels (300 Series) – Can be used to 1600°F (870°C) mostly in oxidizing atmospheres although type 316 can be used in some reducing environments. Ferritic Stainless Steels (400 Series) – Can be used to the 1800°F (982°C) – 2100°F (1149°C) range in both oxidizing and reducing atmospheres. High Nickel Alloys – Can be used to 2100°F (1149°C) in oxidizing atmospheres. Once the selection of materials is made attention should be given to the parameter of flow induced stresses. Fluids flowing by a well form a turbulent wake called the Von Karman Trail. This wake has a definite frequency based on the diameter of the well and the fluid velocity. It is important to provide a well with sufficient stiffness so that the wake frequency will never exceed the natural frequency of the well itself. Should the natural frequency of the well coincide with the wake frequency, the well would vibrate to destruction. Tapered shank wells provide greater stiffness for the same sensitivity than a straight shank well. The higher strength to weight ratio gives these wells a higher natural frequency and therefore are able to operate at higher fluid velocities. Recommended maximum velocity rating can be found for every standard well length and material catalogued. Ratings are based on operating temperatures as shown in the table below. Single values that appear in the velocity tables may be considered safe for water, steam, air or gas. Double values distinguish between water (paranthesized) and steam, air and gases. These values are intended as general guides to selection. If you have operating conditions requiring special well designs our engineering staff is available to assist you. The limit pressure versus temperature ratings are tabulated for various materials for each thermowell series. Here is a typical table. NOTE: Selection of material and/or equipment is at the sole risk of the user of this site. The data presented does not and should not preclude professional engineering design and consulting for your particular application. Marlin Manufacturing Corporation, its distributors, representatives, and the contributors to this site specifically deny any warranty expressed or implied.